This entry was posted on December 15, 2008 at 12:02 am	and is filed under holidays, Martha Doesn't Live Here, pictures, Saturday Stirrings. 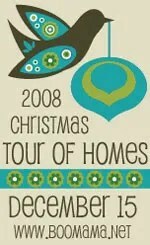 Tagged: BooMama, Christmas Decorations, Christmas Tour of Homes. You can follow any responses to this entry through the RSS 2.0 feed. Both comments and pings are currently closed. Very pretty. Good job on picking such a beatifully shaped tree! What color is the paint in the room w/tree? You COULD be Martha! Everything looks beautiful and I can’t wait to try the spinach balls… a new “treat”! Glad you got brave-you have a lovely Christmas home. I love your home, it looks so warm and inviting!! Merry Christmas!! Thanks for letting us into your home. Merry Christmas. The paint on the wall is Benjamin Moore’s Caramel Apple. It looks even better IRL than in pics! Good job on the tree:) You have great taste! Thanks for the tour! Merry Christmas! Everything looks warm and inviting! Beautiful tree! Merry Christmas to you and your family! If I didn’t know you’d cut down your own tree I’d think it was fake — it’s so perfectly proportioned! And perfectly decked out in all its finery. Beautiful! I think it is all very pretty! Your husband and daughter picked out a beautiful tree! Please come by our house anytime! oops, I had my old link in the comment form! I love the red berries on your chandelier! So pretty! Thanks for sharing! Beautiful Home! Merry Christmas! Your tree is gorgeous and I love how pretty your fireplace and mantle look! Thanks for sharing your lovely home with us. And thanks for the yummy recipe too! Beautiful tree. Thanks for sharing. You cut your own tree!!! Back in the day BEFORE I went back to work full time, we used to do that too. I MISS those days. I LOVE the room where you put the tree – – – those hardwood floors, the paint color, the wood work color – – – ALL of it. Thanks for inviting me into your tour.